At least 18 people died in a high-speed bus crash in Hong Kong on Saturday in one of the city’s worst traffic disasters in recent years. Television footage showed the mangled remains of the bus as it lay toppled on the side of a major highway in the northern reaches of the city. Firefighters on the scene cut open the bus roof to free passengers still trapped inside. Some victims were laid out nearby beneath sheets by emergency workers. Police said at least 18 people, including 15 men, had been confirmed dead on the scene. Dozens more were hurt, some sitting hunched on the highway with blood streaming from their injuries. One elderly man interviewed on television said the driver had been going extremely fast at the time of the accident, even taking bends at high speed. 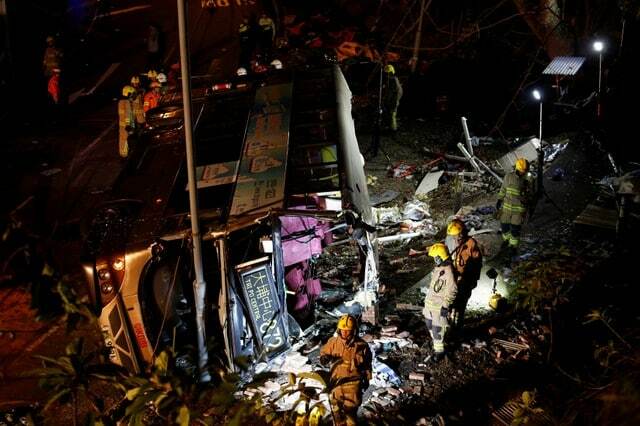 An executive surnamed So, with The Kowloon Motor Bus Co that operated the bus, said HK$80,000 ($10,230) in financial assistance would be paid to the families of each victim. The company said it would also set up an investigation team to probe the cause of the crash.